The firefighting crews have gone from defensive to offensive mode. An expert says he doesn’t think the fire will expand out of the section of the facility where the tanks are. 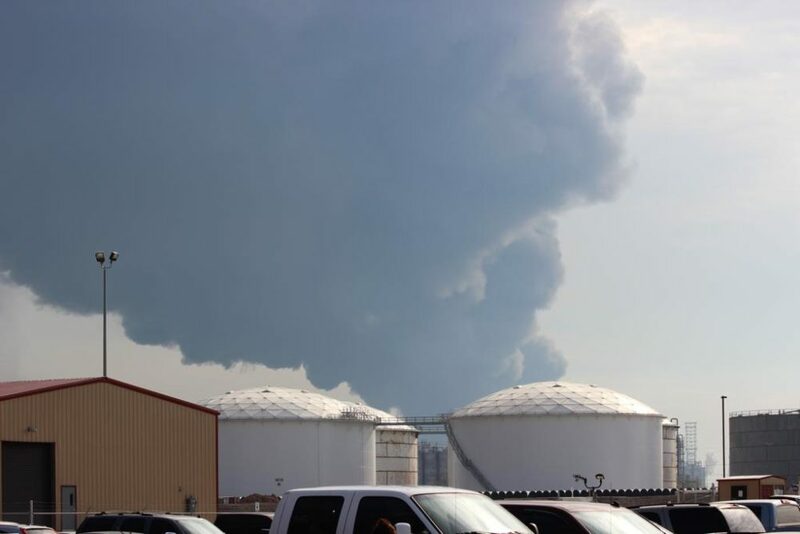 The smoke plume caused by the fire photographed from ITC’s facility in Pasadena. Updated on Tuesday March 19, 2019, at 5:30 p.m. 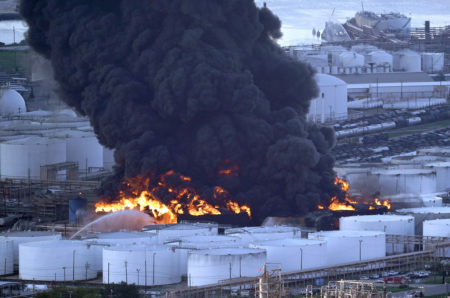 Eight of the 15 tanks at the Deer Park petrochemical facility where a massive fire erupted on Sunday were still on fire as of Tuesday afternoon, the company that owns the facility said at a news conference. Alice Richardson, a spokeswoman with Intercontinental Terminals Company (ITC), said the crews that are fighting the fire are still using water and foam to contain it. Ray Russell, a representative with Channel Industries Mutual Aid (CIMA), said the firefighting crews went “from defensive to offensive” mode on Tuesday and he doesn’t think the fire will expand out of the section of the facility where the tanks are located. CIMA is a non-profit organization specialized in firefighting and hazardous material handling in the refining and petrochemical industry in the Greater Houston metropolitan area. Russell declined to provide a timetable of when the fire could be over. “I can’t speculate on how long this thing is gonna last,” he said. On Monday, officials had said it would take two days for the fire to burn itself out. 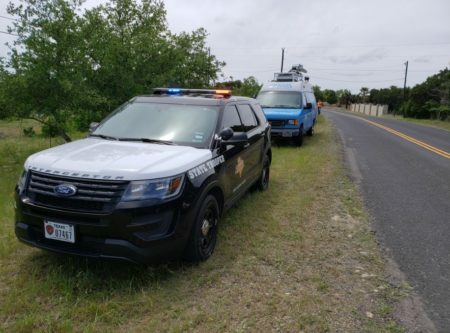 Texas Railroad Commissioner Ryan Sitton said the situation isn’t dangerous for residents because there are no toxins in the air, according to the air quality monitoring. Four different agencies are monitoring the air quality: the Texas Commission on Environmental Quality (TCEQ), Harris County; the Environmental Protection Agency and ITC. Sitton said the TCEQ has 61 air quality monitoring stations in a three county area that includes Harris and 149 pollutant monitors. The commissioner said the readings indicate so far that the levels of particulates are slightly elevated but aren’t dangerous. Richardson said people who need medical attention because of the incident can submit claims to ITC through the website the company has launched to process them. 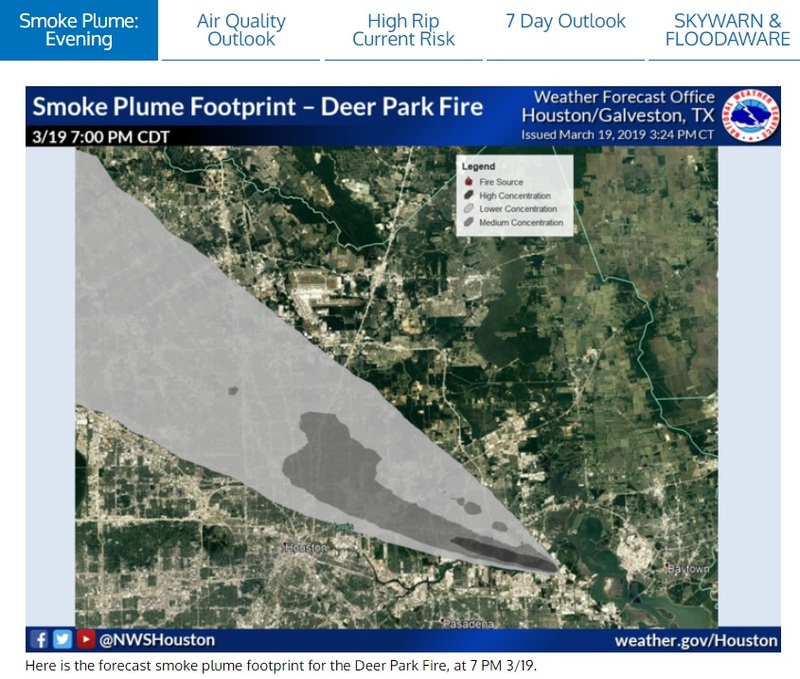 Earlier on Tuesday, Harris County Judge Lina Hidalgo held a news conference and said the smoke plume caused by the fire is at approximately 4,000 feet of altitude, putting it high enough to prevent exposure to dangerous chemicals in the air. The weather forecast indicates winds will push the plume to the east and northwest across parts of Harris, Fort Bend and Waller counties. Deer Park Mayor Jerry Mouton also said the monitoring conducted in that city indicates there is no danger to residents. Hidalgo acknowledged the public’s concern over the visible smoke plume and said there have been reports of residue falling in some areas. In a news release, Harris County’s Office of Emergency Management (OEM) said residents should avoid touching any ashes or residue and wash hands and skin thoroughly for 3 to 5 minutes in case of physical contact. Dr. Umair Shah, executive director of Harris County Public Health, said anyone who needs to touch the residue for any reason should wear gloves. The OEM’s news release added the health risk is “low” because the smoke is several thousand feet above the ground. But it warned of symptoms residents can experience due to the smoke, such as coughing, difficulty breathing, headaches, and irritation to skin, eyes, nose and throat. 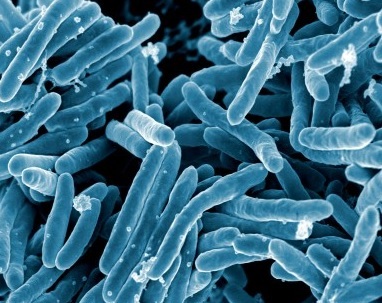 The elderly, children, pregnant women, and people who have respiratory problems may be more susceptible. Hidalgo said the main concerns are wind shifts or a loss of altitude that could bring the smoke and residue down to ground level. She said the county has multiple contingency plans that could include shelter-in-place orders for some cities or even an emergency declaration. Earlier on Tuesday, at a 10 a.m. news conference, the Harris County fire marshal said there isn’t a clear timetable for the fire to end. “We talked about that fuel has burned off and we’ve said from the beginning that may be what has to happen. What I can’t tell you is how long that will take to burn off,” said Harris County Fire Marshal Laurie Christensen. Richardson repeated earlier statements that chemicals detected by a company hired by ITC “were below levels that would represent health concerns.” One of the many chemicals that is being monitored is benzene. ITC has launched a website for businesses and individuals to file claims if they have been impacted by the incident. Harris County is posting online information about air quality.